England 6-287 (Ian Bell 82, Eoin Morgan 49, Joss Buttler 47*, Mitchell McClenaghan 3-54) beat New Zealand 253 (Ross Taylor 71, Martin Guptill 38, James Tredwell 3-51) by 34 runs. England hammered 287 for the loss of six wickets in the allotted 50 overs and the innings of New Zealand was squeezed for 253 with 21 balls to spare. 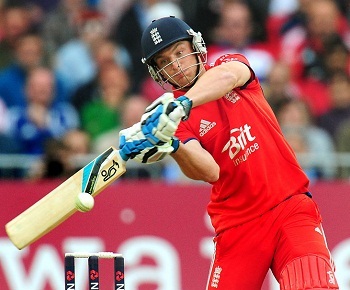 Joss Buttler (England) was declared ‘Player of the match’ for his unbeaten express innings of 47 off 16 mere balls. Martin Guptill (New Zealand) was announced ‘Player of the series’ for his authentic batting with two tons. The third and final One Day International of the series was played on Wednesday, June 5, 2013, at Trent Bridge, Nottingham. Brendon McCullum won the toss for the Black Caps and invited the hosts to bat first. The English captain, Alastair Cook, was declared leg before wicket for a duck as Jonathan Trott and Ian Bell took the responsibility of consolidation. They scored just 6 runs in the first six overs and hit 4 fours in the next three. The score was taken to 69 after 18 overs with 4 boundaries from each batsman as Trott became the second victim of McClenaghan for 37 and was replaced by Joe Root. The latter was dropped at 10 by Martin Guptill off Nathan McCullum and Bell attained his 26th ODI fifty in the 27th over. Ian Bell hit the first six in the 30th over and the third wicket partnership enhanced the score to 149 in 34 overs. Joe Root was run out for 33 and Bell departed four runs later for 82 off 96 with 1 six and 6 fours. Eoin Morgan and Ravi Bopara kept on creeping but were unable to score any boundary in the following seven overs as the second hundred of the innings appeared on board in the 45th over. Bopara lost his wicket for 28 as Joss Buttler took guards in the center and punished Kyle Mills for 22 runs two overs later with 1 six and 4 fours. Buttler added another 2 fours whereas Morgan dispatched 2 sixes before he was runs out for 49 off 40 balls with 3 lofty sixes and 2 fours. 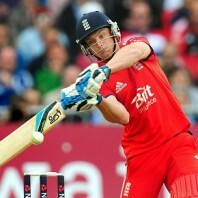 Joss Buttler remained unbeaten for 47 off 16 mere balls with 3 giant sixes and 6 fours as England piled up 6-287 in 50 overs. Mitchell McClenaghan was the highest wicket taker with three whereas Kane Williamson took one. Luke Ronchi and Martin Guptill started off nicely for the Kiwis and scored 33 runs in five overs with 5 fours. The first wicket fell at 39 when Ronchi was caught by Jonathan Trott off Stuart Broad for 22 as Kane Williamson joined in with Guptill who dispatched 1 six and 4 fours in the coming overs but he was clean bowled by James Tredwell for 38 off 36 with 1 six and 6 fours. The second wicket fell at 70 in 9.5 overs as Ross Taylor got together with Williamson and they found it hard to find the boundaries. They crawled to 96 in 16 overs when Kane Williamson was held lbw off Joe Root for 19 and the next batsman, Colin Munro, was caught behind by Buttler off Tim Bresnan without scoring any run. Brendon McCullum remained off colour and was caught behind by Buttler off Tredwell for just six runs and the fifth wicket was surrendered at 111 after 19.5 overs. James Franklin added to the miseries of the visitors after the addition of 11 runs at his individual score of seven runs. Nathan McCullum associated with Taylor next and apparently the run rate was enhanced by the duo. Nathan McCullum hit 2 fours in the 30th over and Taylor hit his first six two overs later. They accumulated 53 runs for the seventh wicket as McCullum was caught superbly by Broad off Tim Bresnan for 28. Ross Taylor achieved his 24th ODI half century in the 40th over and he was finally caught by Bresnan off Tredwell for 71 from 84 deliveries with 3 towering sixes and 2 fours. Tim Southee contributed 28 and Mitchell McClenaghan remained unbeaten for 28 as the entire New Zealand team was bowled out for 253 runs in 46.3 overs. James Tredwell was the top wicket taker with three, Steven Finn, Stuart Broad and Tim Bresnan shared two wickets each whereas Joe Root chipped in with one. England won the third One Day International with a margin of 34 runs but lost the series 2-1 to New Zealand.